The substance most commonly known as R-134A, or freon 134A, is a refrigerant and is used via a compressor to produce this effect. They belong to a group of chemicals known as hydroflourocarbons (HFC’s), that have replaced chloroflourocarbons (CFC’s), due to the latter’s documented negative effect on the environment, particularly the ozone layer. R-134a has a low toxicity, so is safe for use in the food industry. This chemical is an inert gas which evaporates at -15 degrees Celsius. It is these properties that make it suitable as a refrigerant. In refrigeration, a compressor is used to increase the pressure of the R-134A. The compressed, heated gas is allowed to liquefy within the condenser which causes it to vent heat to the atmosphere, before expanding through an expansion device which allows its pressure to drop. This causes it to drop to a much lower temperature than the interior of the refrigeration unit, so the R-134A absorbs the heat from the refrigeration chamber. This then converts the R-134A back into a gas, which then returns to the compressor to begin the process again. The compressor used in the process of refrigeration has to be able to pressurise the R-134A vapour to a saturation pressure and temperature higher than the air naturally available around the condenser, as well as perpetuating the flow of refrigerant through the system. This is the only way that the gas will return to a liquid state or expand as required. Therefore, the compressor pump is an intrinsic part of the refrigeration process, without which refrigeration will not take place. 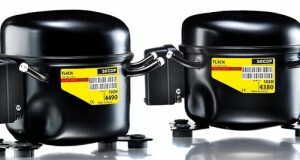 For R-134A compressors, although open compressor types are used, a hermetically sealed unit is more common. This type of compressor has all of it’s mechanical parts within the compression envelope, and can be located within the refrigeration unit to help keep mechanical parts cool during operation. This type of design also ensures that there is no possibility of the R-134A escaping into the refrigerator or of air leaking into the refrigerant, which would negate the refrigeration properties of the gas. The disadvantage to this design is that any mechanical failure within the compressor requires the replacement of the entire unit. A compromise solution is to use a semi-hermetic design which has seals to prevent leakage to allow for maintenance.